Wild: It is difficult to be angry with Haementeria laetus, despite its rather terrible nature. The creature has practically no intelligence, and just attaches to any nearby living flesh in an attempt to drain that creature’s blood. Domesticated: While Haementeria is not intelligent enough to be tamed, and does not provide a resource any tribe would need in large quantities, it is always useful to keep a few around for antidotes. When processed properly, Haementaria venom can be made into powerful antivenin! Known Information: Removing Haementeria requires precision bladework, or access to an open flame. Both of these can be nearly as dangerous to the host as to the leech itself. Once Haementeria attaches to a host, it drains blood at a rapid pace, and the host experiences hunger, losses of health, and lowered stamina. Some Haementeria are also carriers for a dangerous disease I’ve dubbed ‘Swamp Fever’, which persists permanently beyond the leech’s own lifespan. Few creatures on the island are transmitters for this disease, and it can ultimately be cured with a rare medicine. 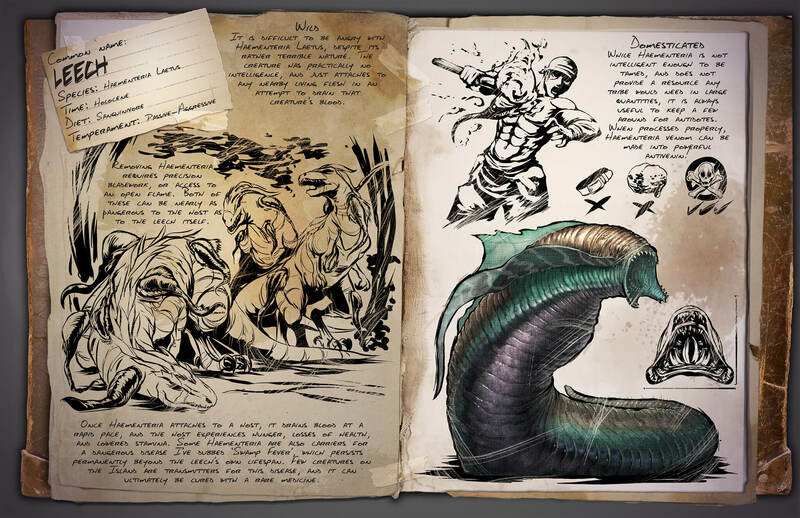 According to the dossier, the Haementeria can be used to create an antidote. This might be aimed at the “venomous” attacks from the titanoboa / scorpion, which means that in the future we can finally walk around without being knocked out by a single bite. Furthermore, the Haementeria will be a carrier of a disease. It has been confirmed that the island will contain multiple diseases, each with their own symptoms and treatments. As a creature will also be capable of transmitting a disease, it could be that it won’t be long before we will see the first sick survivor in an upcoming patch.